A gold 1:8 scale model of Lamborghini's flagship Aventador supercar is to be auctioned off, with a reserve price of $7.5million. The car is the work of German model carmaker Robert Wilhelm Gulpen, who carved it from a half-tonne solid block of gold. The finished car contains 25kg of the precious metal, and is also adorned with gemstones. According to his website, $650,000 of the money raised through the model's sale will be donated to charity. The gold Aventador has already been dubbed the most expensive model car in the world, and is approximately 18 times more expensive than the Aventador supercar itself. This is not the first time Gulpen has created model cars from precious metals. His previous 1:18 renderings of the Bugatti Veyron – also hand-crafted from gold – sold for over $3million each. 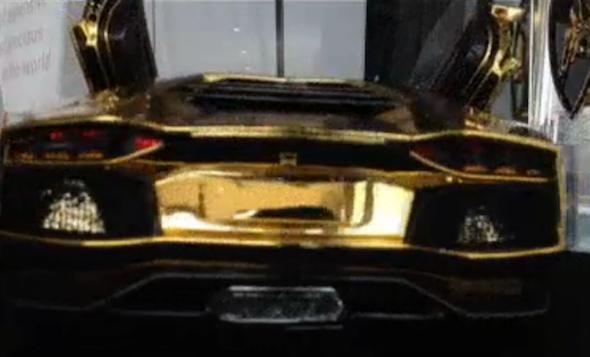 Click play below to see Gulpen's gold Lamborghini up-close.